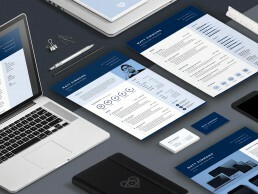 PRO Resume 2, a modern creative resume template for pros. 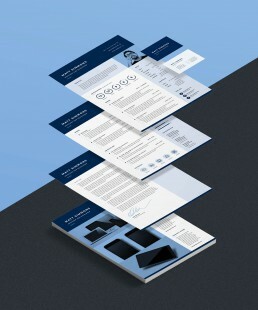 PRO Resume 2’s minimal contemporary design organises your information into clearly defined sections. 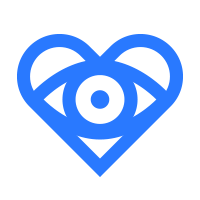 This ensures your key skills and strengths are never overlooked seen by recruiters. 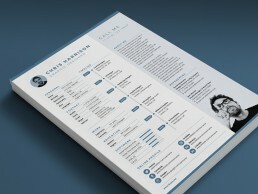 This creative resume templates design features a full-width header for your name and contact details. Below are areas for your business profile, work experience, education and interests. The right side of the page design includes personal information, contact information, social media and business links, skills, tools/software and references section. Infographics and icons are used to visualise information and to make your resume more dynamic. PRO Resume 2 includes a cover letter, a two-page resume template, portfolio page to showcase your best projects and matching business cards. 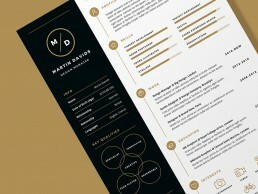 The resume is fully customisable, so you can change colour, text and icons to suit your needs. The resume, letter and portfolio templates can be edited in Microsoft Word, Adobe Indesign, Adobe Photoshop or Adobe Illustrator. Free fonts are used in this design (download links are included in the package). PRO Resume 2 highlights your key strengths and qualities. 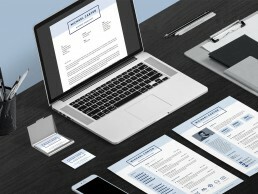 PRO Resume 2 includes two resume pages, cover letter, portfolio and business cards. 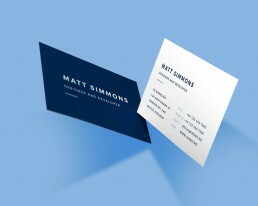 Matching double sided business card template is included for free. 130 icons are included with PRO Resume 2. 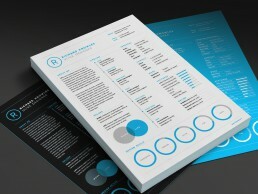 PRO Resume 2 resume template is easy to edit and customise with your own colours.